Two Banbridge Musical Society members are delighted to be part of a charity single, ''available to buy now, in aid of the Royal Belfast Hospital for Sick Children and the ''Children's Medical Research Foundation, Crumlin. Pamela Johnston and Rosemary ''Kelly were part of over two thousand, three hundred voices, joined together with a ''sixteen piece orchestra to record 'When I Grow Up' from the Royal Shakespeare ''Company's award-winning production of 'Matilda the Musical'. It is hoped that it ''could be a strong contender for Christmas number one, as well as raising money for ''a very worthwhile cause. Two Banbridge Musical Society members are delighted to be part of a charity single, available to buy now, in aid of the Royal Belfast Hospital for Sick Children and the Children’s Medical Research Foundation, Crumlin. Pamela Johnston and Rosemary Kelly were part of over two thousand, three hundred voices, joined together with a sixteen piece orchestra to record ‘When I Grow Up’ from the Royal Shakespeare Company’s award-winning production of ‘Matilda the Musical’. It is hoped that it could be a strong contender for Christmas number one, as well as raising money for a very worthwhile cause. Stephen Macken, who previously produced ‘Tiny Dancer’, the second biggest selling charity single in Irish Chart History, once again teamed up with the Association of Irish Musical Societies to create this special charity single. The recording took place in October, as part of a gala concert celebrating the 50th anniversary of the creation of AIMS, the Association of Irish Musical Societies. The CD is being sold exclusively by HMV Xtra-vision in their 92 stores throughout the island of Ireland, north and south of the border. 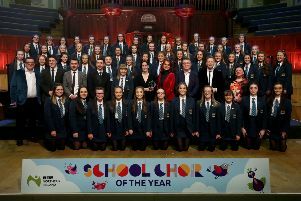 Banbridge Musical Society are hopeful that “When I Grow Up” could be in the running for Christmas No.1. To help make this happen, the song can be downloaded from iTunes. Meanwhile, after the recent success of Banbridge Musical Society’s pantomime, members are still busy. This time getting ready for a charity car boot sale they are holding. This will take place on Saturday December 12 from 10am until 3pm in the car park of the Downshire Arms Hotel, Banbridge. All are welcome to browse or sell, at a cost of £5 for cars and £7 for vans. Anyone who wants to pre-book a space to sell, contact Lee Cairns on 0751 083 1588.